My first time to experienced Japan Bullet Train was on my way to Hiroshima which took me 5 hours and 1 transfer. Without Bullet Train it will took you a day to travel to Hiroshima ( I heard from my Japanese friend)..hahahha.. Or you can fly. Board your Shinkansen from Tokyo Station and change at Shin-Osaka (change platform) and board another Shinkansen to Hiroshima. Easy, fast, comfortable and at your own convenience as I not reserved my ticket beforehand (not holiday period), I can just hop and off at any time and sit anywhere within the unreserved coach. I reached Hiroshima around 5.00 something in the afternoon. But as its winter, outside already dark like 8.00 pm. Compared to crowded and busy Tokyo, Hiroshima is very calmed. But in contrast, I had a hard time to find my way at first to Hiroshima Street Car. Hahahha….Yes, there are using electric train simillar to HK tram, roaming on the same road that other transportation such cars are using. After a help from a station staff, I managed to find it and I found out that my IC card is useless here. Another card is used and I just decided to use cash instead. Waiting for my number 2 Stretcar to my accommodation and a map of Hiroshima Stretcar, I boarded it and only to found out that I need to pay only when I get off at my station, fix price 220 yen 🙂 Learn and learn…. Today must be a day for small and continues problems to happen…hahahahahah….when I arrived at the Japanese style hostel, the owner can’t find my booking and I need to wait. I’m quite nervous and worried but everything was settled later. The kind lady or I can called her grandma showed me my room which I super love…..tired and cold, I just decided to stay in and wake up early for my trip with Natsuki. Meet Natsuki at Hiroshima station where Natsuki arrived early from her house 1 hour away from Hiroshima city… we took the JRline to Miyajima Island. Being one of Japan’s three most scenic spots and UNESCO, I was thrilled. You can used your JR Pass card to ride a boat but I opt and pay another 2000 yen for 2 days pass that included ferry, cable car and also streetcar usage . We were welcomed by deer, yes a real deer and magnificent view of red coloured O-ttori gate. After a tour at Itsukushima Shrine, we headed to ropeway/cable car to Mt Misen and our hiking was begin. We ate at Machiya Street and back to Hroshima City. Hiroshima city was calmed and peaceful compared to Tokyo. Beautiful bridge and river cross the city. Without the historic dome left carried the sad and painful Hiroshima Atom story in the middle of the city. Nobody will ever imagined that this beautiful city was involved in first ever atom war. Visit the Hiroshima Museum for better knowledge about what happened on that day. We ended our day with Hiroshima Okonomiyaki style at Hiroshima station. The next day before I left Hiroshima to Kyoto, I paid a visit to Hiroshima castle to end my visit. 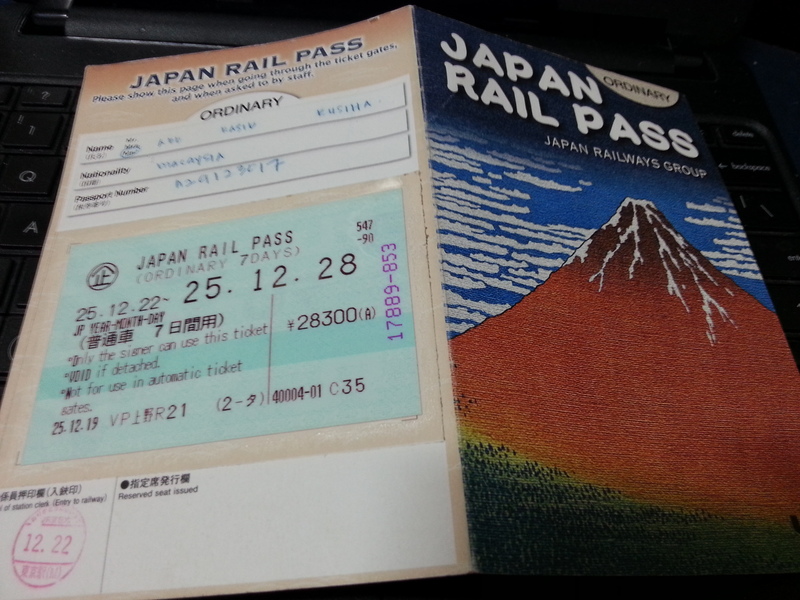 I thought I can just buy the JR Pass online and print out the copy of the ticket and exchange it to the real pass once I reach Japan. That was what I believe and knew based on my reading. But I just realised a few days before I left that I can buy it online but it need to be post to me which my departure date is too near and it can’t be done…aiksssss… My nervous mode is activated!!!! But once I read carefully again..really carefully … I can also buy it from appointed travel agency. As i’m in Seoul, I just went to the most well known travel agency in Korea which is Hana Tour and their branch is in Itaewon. I went there on Monday and thanks to God that I managed to secured my JR Pass and as I went to branch office, I need to pick up on Wednesday, just enough time before I left to Incheon Airport on Wednesday night. 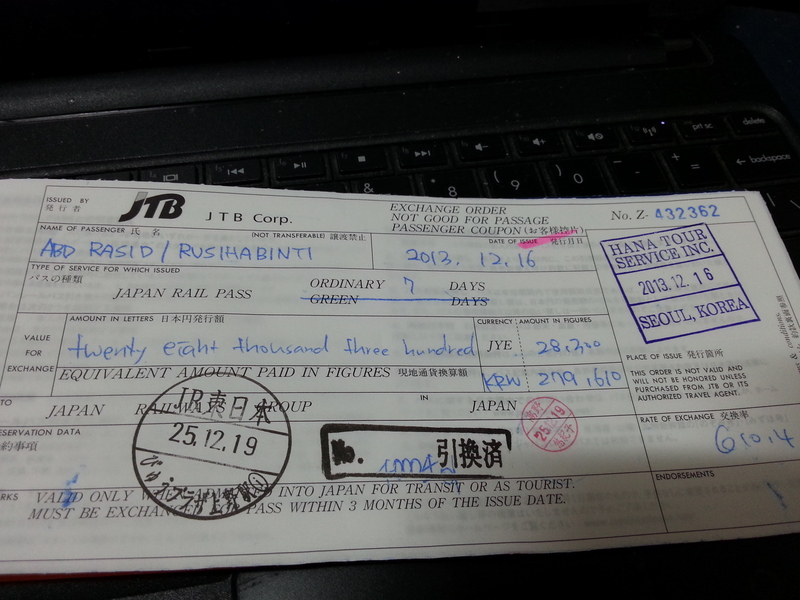 Once you arrived in Japan, you can exchange your JR Pass with a real one at any JR office. I exchanged mine at Tokyo Station as I only going to used mine on my first location which is Hiroshima. After filing up a form and show your passport and stated the first date you are going to used it, tadaaaa… you will receive your valid JR Pass which you can use for all Shinkansen except Nozomi or certain route of Shinkansen, JR subway, JR Bus or JR Ferry unlimited during your chosen period. As Tokyo has around 10 million population and subway is the main public transportation which tend to be super crowded, I opt for IC card. A transportation card which you can top-up and use to skip the hassle of needing to buy a ticket before departing. 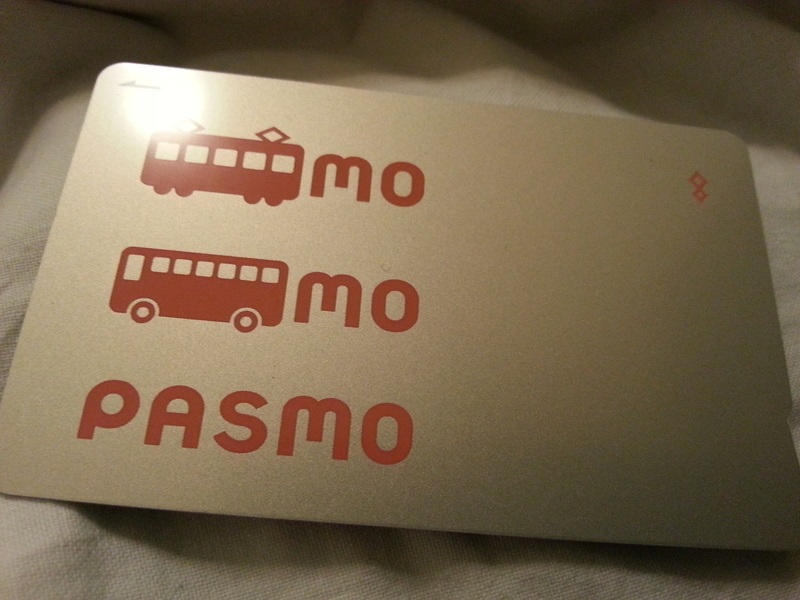 This card can be used with any subway lines in Tokyo which been operated by several different companies. 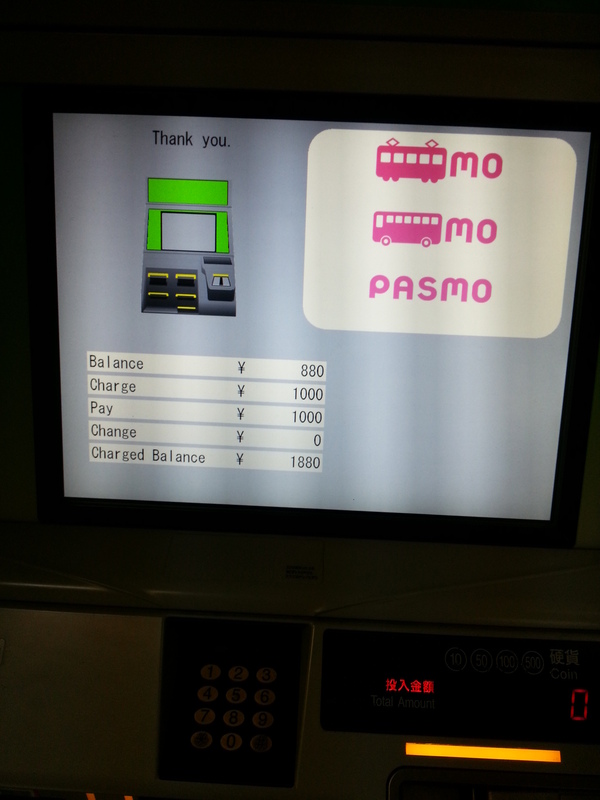 It also can be used at Kyoto and Osaka but not at Hiroshima (based on my experienced). IC card. Mine is PASMO. Other cards also available but all can be used on the same IC slot machine. Reading the Tokyo subway map already gave me a headache and finding out the available, the fastest and the cheapest route to commute is out of question. So, I prepared myself beforehand with the how to go to each locations using navitravel (This application can’t be used offline – if i’m not mistaken and its hard to find free wifi in Tokyo). To go to 1 location which required 2 or 3 transfer will cost around 160 yen, so basically I used not more than 800 yen a day for transportation to go to 3-4 attractions a day. And sometimes you can just walk in between locations. So, prepare your comfortable walking shoes and walk alot!!! After the second day, I had confidence to move around using Tokyo subway. Although it can be really crowded and confusing with several difference trains bound to different places using the same track and platform, take your time to re-confirmed the right train with the digital information panel. And travelling is all about being prepared to be lost and learned. Or why don’t asking Tokyo people to re-confirmed. Believe me, they will help!!!! A few days before i left, i still can’t figure what should i do or go in each city. 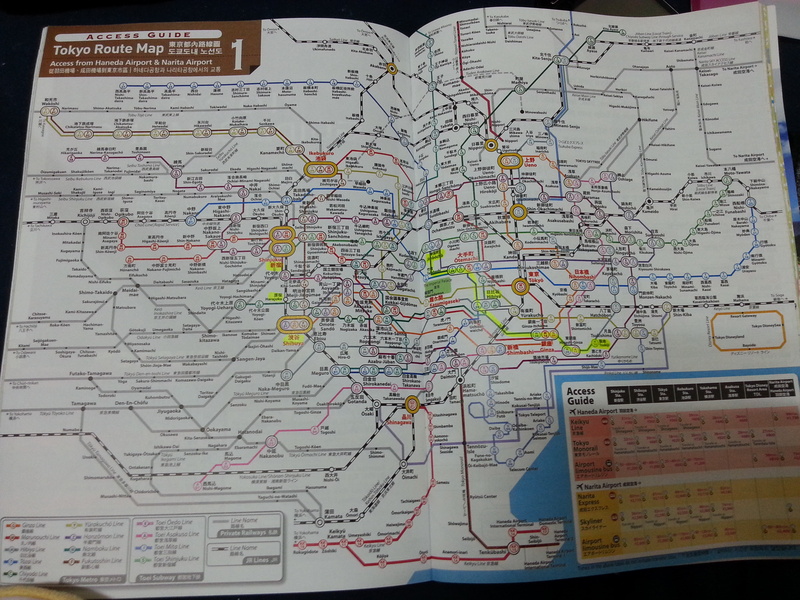 Tokyo especially give me a headache only by looking at the subway map… much complicated than Seoul Metro!!! and i can’t speak any japanese language beside Arigato, Konichiwa, gambate and watashiwa anatawa sukidese…hahahah…But what i learned was, you really need to know at least how to get to your accommodation by subway and if you survive, your days in Tokyo will be easier and pray really hard to God!!!! 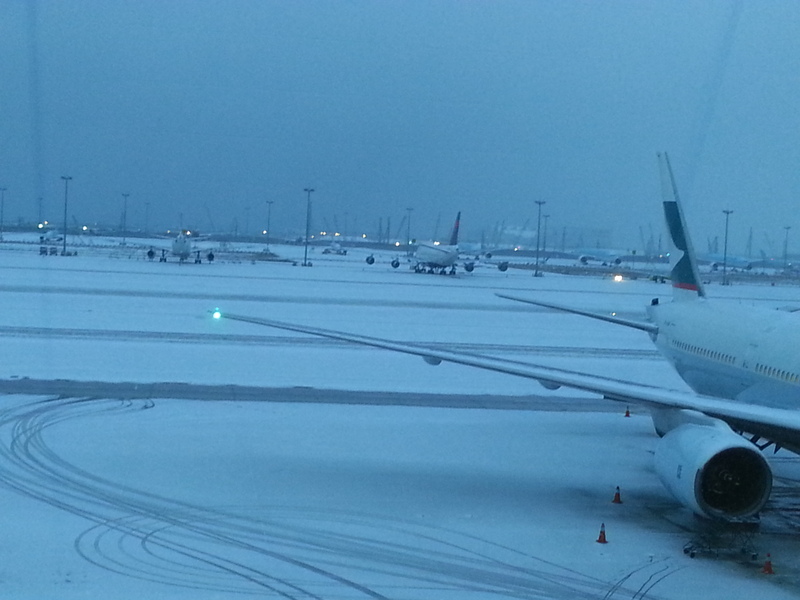 My day started as early as 12 midnight at Incheon airport, sleeping at the airport for my early check-in around 5.40 am. Can’t get any sleep at all, i boarded the plane but stranded for 2 hours due to heavy snow and icing…flew to Narita and arrived of course really late. The first thing i did was to connect to wi-fi and kakaotalk my friend Kana to inform her that our plan to meet should be delayed to 3.30 pm instead. Took my bag, found the information counter to ask where should i took the subway.. Follow the signage and in front of me was a a ticket machine which i suppose to use to buy the ticket but i do not know how. 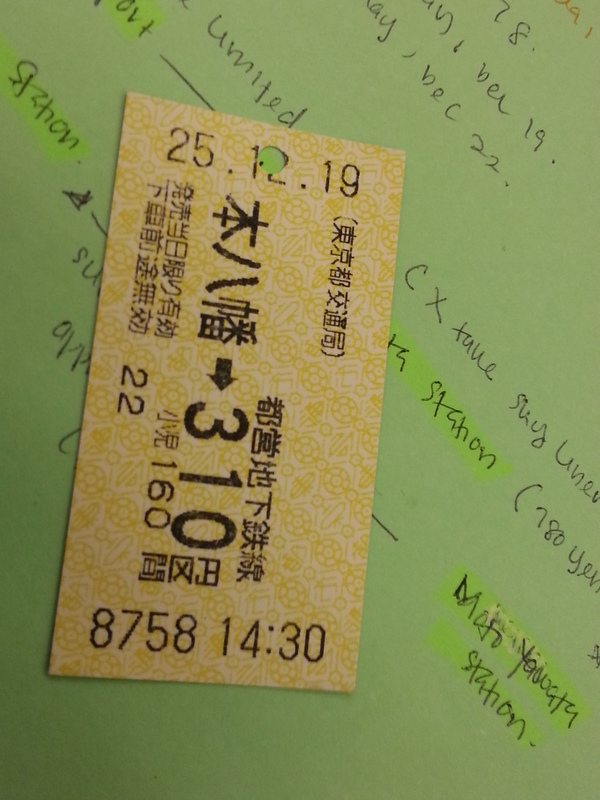 Instead of the name of the station, it only show the ticket price. I was glad that the place i stay Sakura Hotel Jimbocho stated the name of the station i should go with price ( ahaaa…now i know why they put it in their information). Choose as the price stated, pay and took the ticket. Just make sure you go to the right subway….not like Malaysia or South Korea, Japan has too many choices of subways/Trains you can choose based on your destination and price and time, lalalala…from the airport to downtown. I survived with Allah help to arrive at my hotel around 3.20 pm and the first i saw was my friend Kana waiting at the cafetaria of the hotel. hahahahha… I’m alive!!! i told her..ehhehe (believe me i really meant it). Check-in, throw my luggage and carry my backpack, both of us went out directly to explore Tokyo!!! Heavy rain accompanied us to our first destination Sensoji,a famous temple at Asakusa. It was beautiful, more beautiful if the weather is kind. On the road to the temple, many shops selling japan delicacies, and souvenir. We stopped at least 4-5 shops bought and tasted Japan snacks, sweets, breads, etc. Goshhh, i was full before i reach the temple. From the temple we can actually see Skytree, but due to bad weather, nothing can’t be seen. I love this coz i can get a big picture of Tokyo area so that i don’t waste my time, money and energy by grouping the the places i want to go based on location. I will try to give more details on the transportation cost at Tokyo by subway later 🙂 .. Got to sleep and wake up early in the morning to explore Hiroshima with Natsuki… huhuhuhu.. i always end up waking up late lately!!!! OMG!!! Japan Trip really cost me a lot..transportation for bullet train (JR Pass) already cost me around RM1K ..not included normal subway, accommodation and food, etc for 11 days. 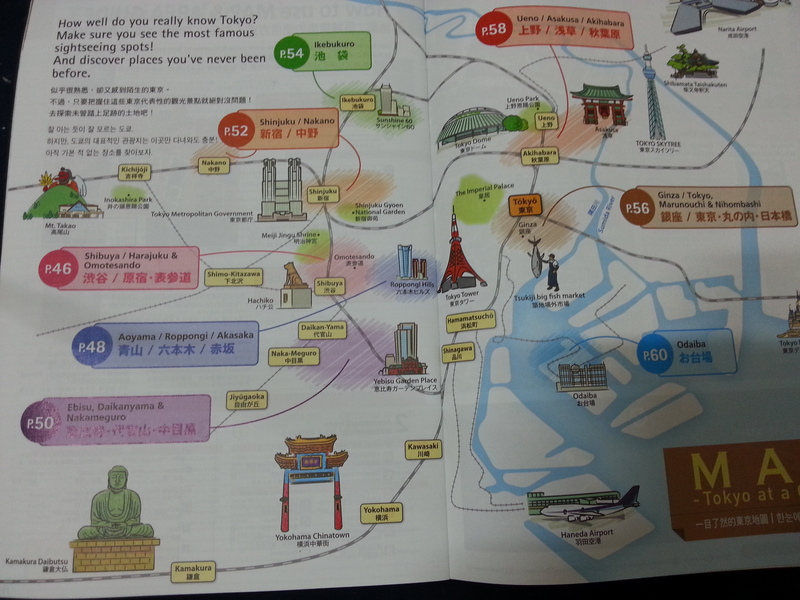 Maybe i will covering not only Tokyo but Hiroshima, Kyoto and Osaka plus additional places like Nikko and Nara.. huhuhuhuh..I can’t afford to hail a taxi or rent a room nearby Incheon Airport for my early flight to Narita Tokyo. After Google around, i found that Incheon is among the best airport to sleep. So, for the first time, i just want to give a try!! And here i am with lots of time to kill ..enough for me to post again after a long time. There are lots of places to rest before your flight and they also provide a Rest & Relax area at 4F, East and West Terminal. 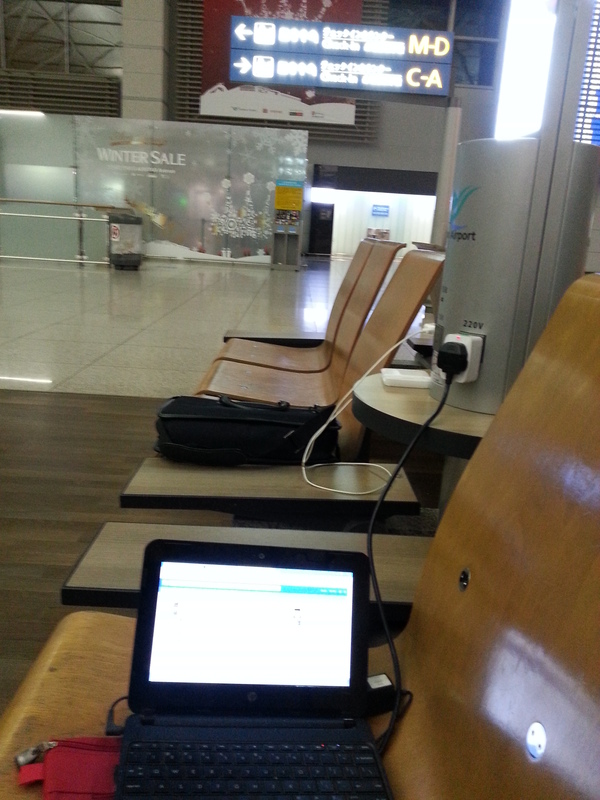 If you just want to connect to internet and charging your device, the whole airport has free Wifi and you can find many charging places. In case you are hungry, 24 hour Fast Food also here. Or you want to watch TV, at arrival hall has many. You can check more facilities provided by the airport from their website. And here i am, with my half closed eyes will soon biding goodbye to Seoul and Hai to Japan for next 11 days!! !